Tonight we’re eating pork tenderloin marinated with sambal oelak, balsamic vinegar, and rosemary. 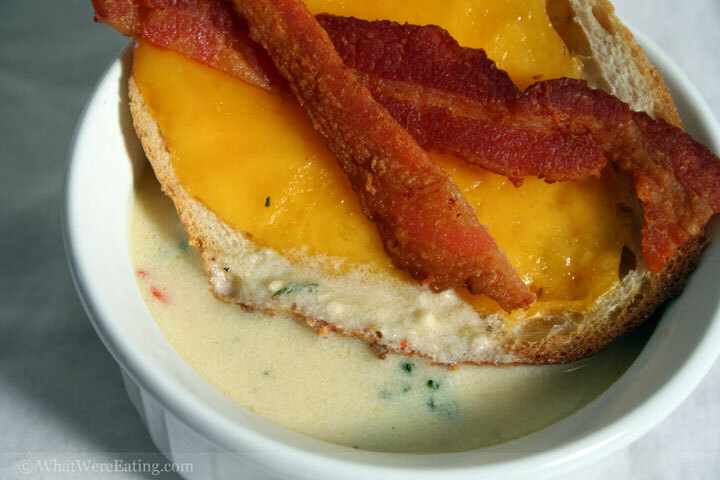 The tenderloin was accompanied by a broccoli and cheddar soup with bacon cheddar toast and field greens tossed in a homemade rosemary balsamic vinegarette. 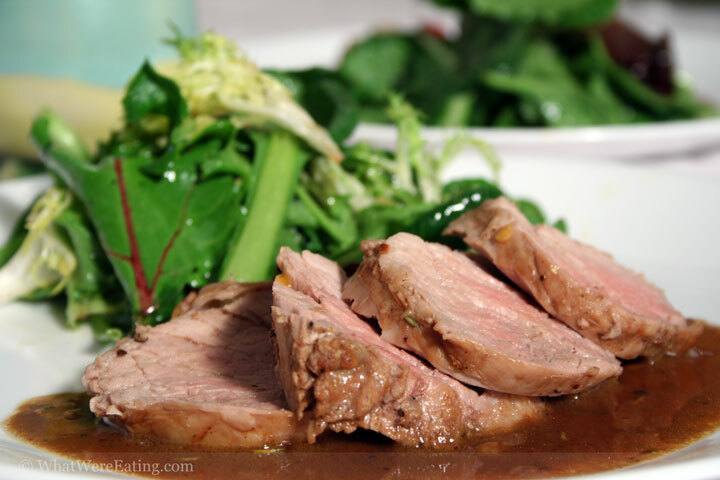 Balsamic and Rosemary Marinated Pork TenderloinA: Finally! A home cooked meal. I had a bunch of broccoli that needed to be used up before it went bad. Thus tonight’s creation. T: Yeah it’s been a while since you cooked, and it was delightful. A: thank you thank you, i do enjoy cooking – A LOT. it pretty much fills my day (at least thinking about cooking, now that i’m not making a living cooking). T: that’s what makes you so good at it. You’re thinking about things with food that I don’t even have a clue about… all I know is it’s damn good. I still love to think about the night a couple of months ago that you woke me up in the middle of the night talking about how asparagus was almost in season. Heheh, you were talking in your sleep. Too funny. A: heheheh i know. i just have no control over it! i can’t get my mind off what i’m gonna make next. and now asparagus IS in season here. it’s been mega cheap lately, like less than two bucks a pound. we have some in the fridge, as we speak. T: So, what is not in season now that you are looking forward to? T: I’m excited about the artichokes too. Everytime I see them I think about getting some. There is nothing better for me than boiled artichokes, eaten leaf by leaf. A: i know, you do love them, nostalgia, right? i’m sure you’re not excited about all the tomatoes i’m gonna get, huh? T: actually, I *am* excited about the tomatoes. I love tomatoes. I just don’t get excited about raw tomatoes. A: mmmmmm… raaaaw tomaaatoooos. yum. i’m one of those people who can just eat tomatoes, as they are. i also really like tomato sandwiches (and tomato biscuits, for breakfast). T: man just roast that tomato a little bit and it’s good to go I know I’m strange for not liking them raw… maybe someday. I’m trying here.